This set of three candles, hand-painted by South African artisans, arrives in a recycled cardboard gift box. Each petite candle is 2.5 inches tall by 1.75 inches in diameter. 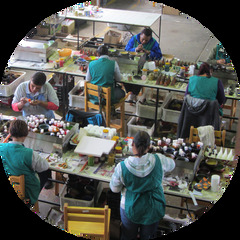 NOBUNTO is a South African Fair Trade company that creates high-quality hand-painted candles, ceramics and handcrafted greeting cards with the utmost attention to detail using mainly African inspired designs. Their mission is, in a region with high unemployment, to alleviate poverty, not only through the development of industry but to be socially, ethically, and sustainably responsible.